The momentum in price growth that emerged in 2013/14 is expected to continue to support prices in 2014/15 and to a lesser extent in 2015/16, according to leading property industry analyst and economic forecaster, BIS Shrapnel. However, rising construction and the potential for oversupply in many markets, together with an eventual tightening in interest rate policy, will impact on prices and potentially create conditions for price declines by 2016/17. According to the company’s Residential Property Prospects, 2014 to 2017 report, tight markets and low interest rates have been the catalyst for the strength in the Sydney, Melbourne, Perth and Darwin markets over the past 12 months, as well as an emerging upturn in Brisbane. In the other capital cities, low interest rates have been helping to support stronger purchaser activity, if not stronger price growth. 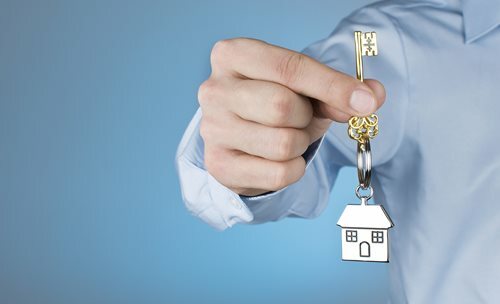 BIS Shrapnel senior manager and study author, Mr Angie Zigomanis, says that although prices have been rising in a number of capital cities, affordability at current interest rates are sufficiently attractive to maintain further price growth for now. Rising construction pipelines have not yet worked their way through to completion and therefore supply, so pressures in most markets still remain. “The current standard variable rate of 5.95 per cent is, outside of the GFC emergency low interest rates in 2009, the lowest level in over 40 years,” said Zigomanis. “As a result, affordability in most capital cities remains at early-2000s levels, which should be supportive of price growth. “The low interest rates have had minimal impact on first home buyer demand, which has weakened considerably as state governments have removed incentives for established dwellings in favour of targeted incentives for new dwellings. However, this weakness has been more than compensated for by the strength of ‘next time buyers’ and investors. These conditions are expected to continue to support prices over 2014/15 in light of relatively muted economic conditions as the economy transitions from being driven by resource investment to being driven by consumption and business and residential investment. However, although price rises are expected to continue, the rate of rises will be varied across the capital cities in this time. The strongest conditions are forecast for New South Wales and Queensland, where BIS Shrapnel estimates sizeable dwelling deficiencies are in place, as reflected by their low vacancy rates. In comparison, the rate of price growth in Melbourne is expected to slow in response to rising new supply and emerging affordability pressures. While rapidly weakening economies in Western Australia and the Northern Territory – as mining investment is wound back – will cause price growth to also slow in Perth and Darwin. With limited dwelling deficiencies, or oversupplies, the markets in South Australia, Tasmania and Australian Capital Territory are expected to remain relatively flat. The change in gears from resource investment to domestic demand driving the economy will be slow, although it is forecast to eventually come through and begin to have a positive effect on the economy and employment later in 2015. To some extent, this will support house prices, although it will also signal the beginning of a tightening in interest rate policy. “Initial rises are likely to have a limited effect with the economy strengthening, although further rises will more significantly impact on affordability and prices through calendar 2016, while also eventually having the desired effect of slowing economic growth and inflationary pressures,” said Zigomanis. Variable rates are forecast to peak at just over seven per cent by the end of 2016. While below previous peaks, it will nevertheless be sufficient to strain affordability, particularly in Sydney and Melbourne where recent price growth has been strong, with the impact of higher rates also compounded by rising supply. The current rise in purchaser activity and prices is driving an increase in new dwelling construction. Nationally, BIS Shrapnel anticipates 184,400 new dwellings will be commenced in 2013/14 and 190,000 in 2014/15 – some 31 per cent higher than in 2011/12 – with multi-unit dwellings increasing by 43 per cent to a record of almost 80,000 dwellings in 2013/14. Total dwelling construction compares with an average underlying demand for 151,100 new dwellings per annum over the next five years. As these dwellings reach completion, the stock deficiencies in most states will begin to be eroded. 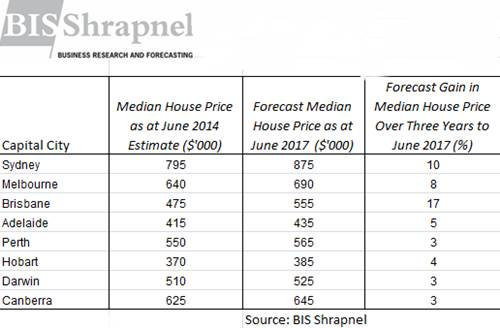 The strongest price growth over the next three years is forecast for the Brisbane market, where affordability has improved significantly after weak price performance in recent years, and low dwelling construction means there is a sizeable deficiency in place. The momentum in the Sydney market is also expected to continue for now as the market is estimated to still be in deficiency. However, as rising new dwelling supply works its way through to completion, pent up demand pressures will ease and the strains on affordability as interest rates rise will take their toll, leading to a forecast price decline by 2016/17. Price growth in the Melbourne market is forecast to steadily slow from 2014/15 as large swathes of new apartment supply are completed. Similarly, the Perth and Darwin markets are also forecast to progressively weaken and prices may even eventually fall as resource sector investment continues to weaken, impacting local economic conditions. An estimated excess supply is forecast to continue to dampen the markets of Adelaide, Canberra and Hobart, together with relatively limited local economic outlooks. However, low interest rates in the current market are expected to continue to support prices as vendors are able to hold on until they achieve their desired prices. By June 2017, only the Brisbane and Sydney markets are expected to have experienced any growth in house prices in real terms over the previous three years, with all remaining capital cities expected to have recorded real price declines. This media release was supplied by BIS Shrapnel who have provided findings from their Residential Property Prospects, 2014 to 2017 report. For more information you can access the Residental Property Prospects 2014-2017 report here. BIS Shrapnel is Australia's leading provider of industry research, analysis and forecasting services. BIS Shrapnel helps clients better understand the markets in which they operate, through reliable and detailed market data, analysis of developments and drivers and thoroughly researched forecasts.